The School Completion Programme plays a central role in the Department of Education & Science strategy for the retention of children and young people in primary and post-primary schools. The aim of the School Completion Programme is to achieve better education outcomes for all children. Supports are offered in school, after school, out of School and during holiday time in recognition of the fact that continuous support must be given to young people at risk of early school leaving. 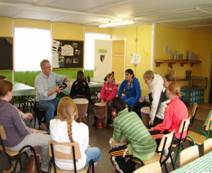 Attendance Tracking, Breakfast Club, Art Therapy, Counseling, Transfer Programme, Bodhran Classes, African Drumming, TOFE Canteen, Dance Classes. 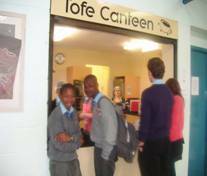 The TOFE Canteen started last September as a project to encourage students to eat healthy and participate in the day to day running of a food outlet. The students doing the Gaisce awards help out serving lunch while other students help with the cleaning. The Canteen is a project undertaken by the SCP that we hope to continue to operate in the coming year. Profits from the canteen go towards new projects in the school and this year we purchased 10 African drums that we hope to introduce as an activity in the coming school year. 2010-2011 profits will go towards creating an allotment beside the Canteen where we can grow our own herbs and vegetables. AFRICAN DRUMMING …We Drum for community, We Drum to celebrate, We Drum for fun. GET FIT GET DANCING : Every Thursday for students interested in Hip Hop dancing class 3.15pm-4pm, all welcome. Each year we try and include new activities for students to encourage them to attend school.